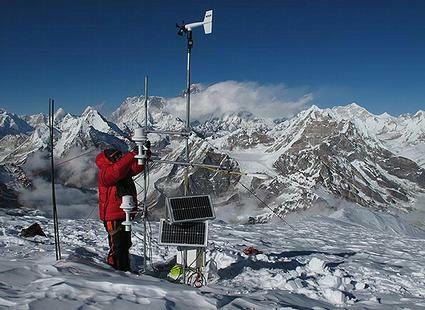 KATHMANDU, Nepal, June 3, 2015 (ENS) – If greenhouse gas emissions continue to rise, glaciers in the Mount Everest region of the Himalayas could melt away in this century, a team of researchers in Nepal, France and the Netherlands has found. Glacier volume could be reduced between 70 percent and 99 percent by 2100, the researchers predict. 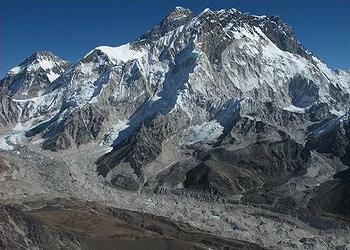 “The signal of future glacier change in the region is clear – continued and possibly accelerated mass loss from glaciers is likely given the projected increase in temperatures,” says Joseph Shea, a glacier hydrologist at the International Centre for Integrated Mountain Development in Kathmandu, Nepal, and leader of the study. The glacier shrinkage will depend on how much greenhouse gas emissions rise, and on how this affects temperature, snowfall and rainfall in the area. The research was published May 27 in “The Cryosphere,” an open access journal of the European Geosciences Union, EGU, based in Munich. Glaciers in High Mountain Asia, a region that includes the Himalayas, contain the largest volume of ice on Earth outside the polar regions. To find out how glaciers in the region will evolve in the future, the team started by using field observations and data from local weather stations to calibrate and test a model of glacier change over the past 50 years. The research team studied glaciers in the Dudh Kosi basin in the Nepal Himalaya, which holds some of the world’s highest mountain peaks, including Mount Everest, and more than 400 square kilometers of glacier area. “Apart from the significance of the region, glaciers in the Dudh Kosi basin contribute meltwater to the Kosi River, and glacier changes will affect river flows downstream,” said Shea. While increased glacier melt at first increases water flows, ongoing retreat leads to reduced meltwater from the glaciers during the warmer months. The greatest impact on local populations happens before the monsoon when rainfall is scarce. Glacier retreat can also result in the formation and growth of lakes dammed by glacial debris. Avalanches and earthquakes can breach the dams, causing catastrophic floods that can result in river flows 100 times greater than normal in the Kosi basin. “To examine the sensitivity of modeled glaciers to future climate change, we then applied eight temperature and precipitation scenarios to the historical temperature and precipitation data and tracked how glacier areas and volumes responded,” said study co-author Walter Immerzeel of Utrecht University in the Netherlands. “Our results indicate that these glaciers may be highly sensitive to changes in temperature, and that increases in precipitation are not enough to offset the increased melt,” said Shea. Increased temperatures will raise the rates of snow and ice melt, and can also result in a change of precipitation from snow to rain at critical elevations, where glaciers are concentrated.